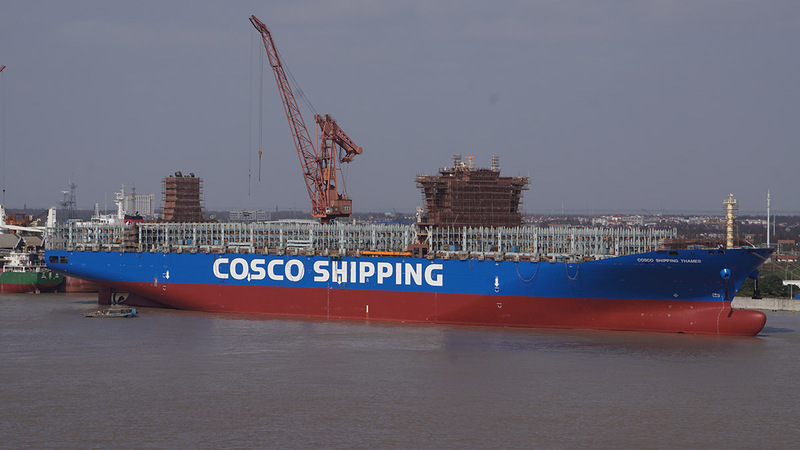 SHARE TRADING OF COSCO SHIPPING HOLDINGS HAS BEEN HALTED SINCE MAY 17 DUE TO ASSET RESTRUCTURING BEING PLANNED. SPECULATION is rife that China Cosco Shipping Group has finally inked an agreement to acquire Orient Overseas (International) Ltd, with an official announcement expected by Monday. A message, thought to have been sent by OOIL management to its staff, has been circulating on Chinese social media over the weekend. It says the company’s chief executive, Andy Tung, whose family controls 69% of Hong Kong-listed OOIL, confirmed via an internal conference call on Friday that the family had agreed to sell all its shares to Cosco Shipping. “It will take about half year for the transaction go through government approvals, after which OOIL will remain listed in Hong Kong, " the message said, adding that the company's container shipping outfit, OOCL, would keep its trademark and brand. When approached by Lloyd’s List, an OOIL executive said he was aware of the talks, but unable to confirm the authenticity of the message. Lloyd's List was told by separate sources that the acquisition was likely to be the entire equity of OOIL and could be worth more than $6bn. An exchange filing from Shanghai- and Hong Kong-listed Cosco Shipping Holdings, the container shipping and port outfit of the Chinese conglomerate, could be expected to come by Monday morning. Share trading of CSH has been halted at the Shanghai Stock Exchange since May 17, when the company made an initial disclosure that its parent was planning a major event. The long-waited deal, if it materialises, will mark yet another major acquisition move in an industry where economies of scale appear to have become increasingly crucial for each carrier’s survival, with an escalating level of consolidation. Maersk Line is in the process of acquiring Hamburg Süd for $4bn, following CMA CGM’s purchase of NOL last year for $2.5bn. The three Japanese shipping giants — NYK, MOL and K Line — have also just established a joint venture business to merge their container shipping and overseas port operations. The transaction, assuming it goes through, will boost the Chinese carrier’s fleet capacity to 2.4m teu, outstripping its Ocean Alliance partner CMA CGM and becoming the world’s third-largest carrier, according to Alphaliner statistics. With the orderbook included, the merged fleet capacity would increase to 3.1m teu, trailing just behind Mediterranean Shipping Co’s 3.3m teu. The reorganisation in capacity will change the balance of power within the container shipping industry, with the top three carriers no longer all European. It will also shift dynamics within the Ocean Alliance, where CMA CGM is currently the largest member. But while scale matters, Cosco Shipping will gain more than just capacity. OOCL is regarded as one of the best-run container lines in the business. While there should be fewer clashes of corporate culture than if Cosco had succeeded in its tentative bid for Hamburg Süd last year, the Chinese carrier should benefit from OOCL’s westernised business disciplines. The Cosco group is undoubtedly on the march, buying terminal assets as well as expanding its container operations, first through the merger with China Shipping, and now the bid for OOIL. The deal will also add to Cosco’s port interests, with OOCL owning the concession for the state-of-the art Long Beach Container Terminal in southern California. That in turn will add to further pressure to consolidate terminal operations in the LA/Long Beach complex, where alliance partners Evergreen and CMA CGM each have separate facilities, as does Cosco. More immediately, though, this takeover — assuming it goes through — will add to further concentration in the container shipping industry, which has involved just about every major carrier, with the exception of Mediterranean Shipping Co. But none of this will make any sense unless the industry can produce decent financial returned. And yet, ironically, the line that probably achieved the best results during a difficult 2016 was MSC, which prefers to grow through ship purchases rather than corporate acquisitions, so avoiding all the pitfalls of trying to integrate another company, while picking up new business during the inevitable upheaval of the amalgamation process. OOCL customers are used to a tip-top service. All the other carriers will be trying to woo them as Cosco and OOIL embark on what is likely to be a tricky and sensitive takeover of one of container shipping’s top names. Speculation over the deal had been swirling around the market since late last year, despite repeated denials from the two companies. Last month, Lloyd’s List was told by a banking source close to Cosco Shipping that the acquisition discussions were real, although pricing OOIL was a tough task for the state-owned giant. The source suggested by then that a takeover at a premium against the book value of OOIL would be difficult. Management of OOIL later denied the takeover talks during the recent Daiwa Auto & Industrials Leaders Conference, while adding that a sale was only possible if a buyer was willing pay at a very attractive price in cash. OOIL’s share price closed at HK$60 ($7.68) on Friday, a 78% surge from the beginning of this year.